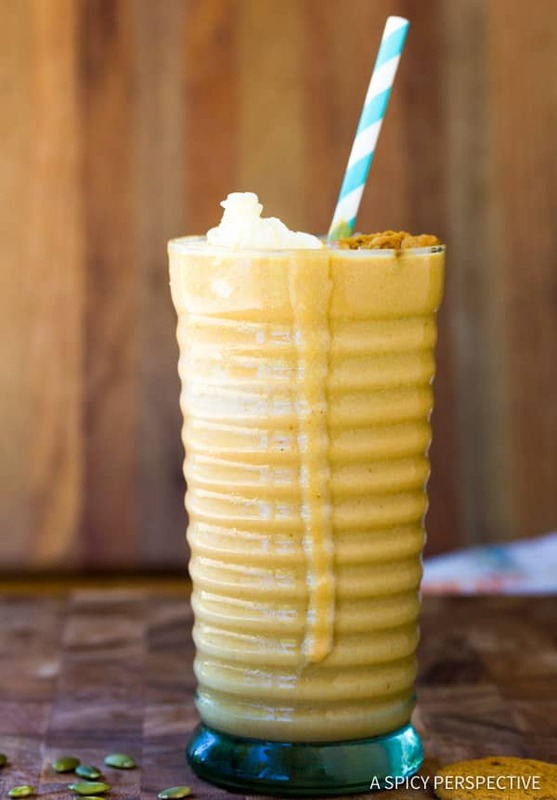 This silky Pumpkin Pie Milkshake recipe is the perfect treat for fall! October brings a whirl-wind of crisp cool air, leaves, and Halloween. Growing up, my family never really made a big deal over Halloween. Some years we trick-or-treated, some years not. So you can imagine what a shock it was to buy a house in a neighborhood with Halloween Fever! Yes, we live in one of those neighborhoods… Every town has one. A spooktacular neighborhood where houses are decked out in ghoulish garb, children and adult alike are adorned in ghastily get-ups, and candy flows like milk and honey one night a year! It just so happens that we bought a house on the main drag, so our road actually gets closed off for hundreds thousands of people to stroll down Halloween night. Year after year we watch our neighbors out-do each other with magic shows, man-powered floats, and Hitchcock movies blasted on the sides of houses. A former art professor down the street, carves masses of the most amazing pumpkins you’ve ever seen and hangs them in trees! It’s a full-moon affair, you could say. The candy has become an issue. Last year we gave out 1500 treats! No, that’s not a typo. Can you imagine buying enough treasures for 1500 little goblins? We have to buy bigger items so we can give each child one, in order to keep count for the next year. It’s part of the package deal, living in this neighborhood. We’ll just consider it an association fee. This Pumpkin Pie Milkshake recipe was a treat I served to our Halloween party guests several years back and it’s bit a seasonal favorite in my house ever since. We tested multiple milkshakes that year, but the Pumpkin Pie Milkshake was the winner! 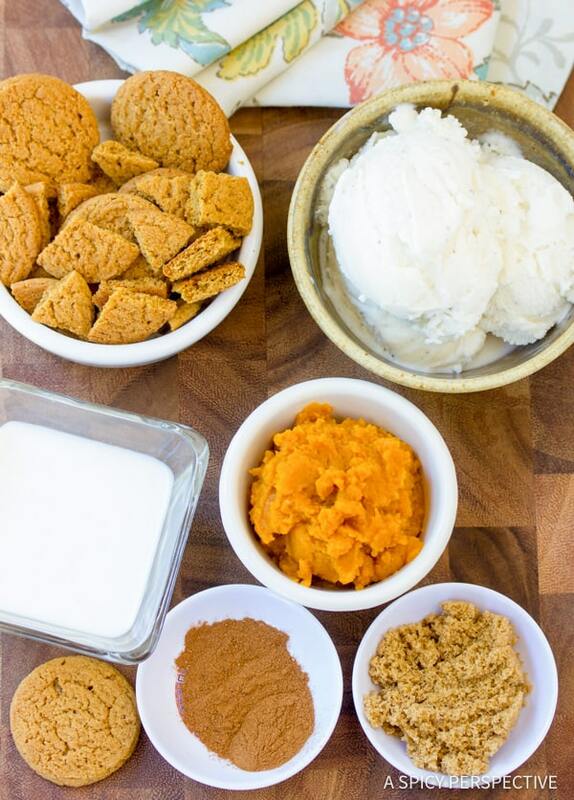 Easy to make Pumpkin Pie Milkshake Recipe, with pumpkin, spices, and gingersnaps blended in! 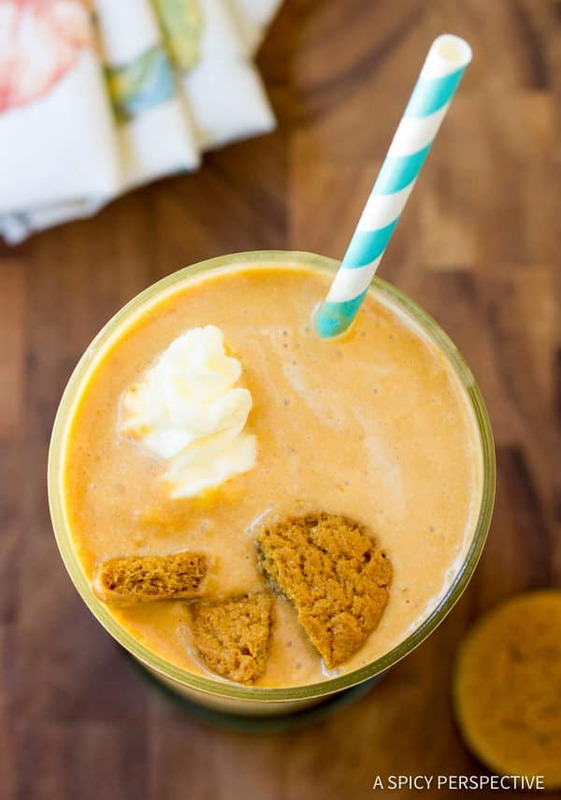 This silky pumpkin shake recipe is the perfect treat for fall! Puree all ingredients in the blender until smooth. Garnish with extra cookies pieces or pepitas (pumpkin seeds). What a great way to get some pumpkin! Healthy and delicious. I love the extra cookie crunch on top. Sommer’s house is da bomb on Halloween! I would not have believed the madness if I had not been there. So much fun and so many people! Can’t wait to try this milkshake! What a perfect Fall milkshake! Pumpkin in milkshake sounds so good! Making Java-Squash this weekend. Wow, great job here. Awesome picture too! You should really consider submitting this to Recipe4Living's Ghoulishly Good Halloween Recipe Contest! It looks delicious! Wow. I utterly adore the Halloween spirit in your neighborhood! I have no idea how you manage to cook/bake for 80 guests and hand out treats to 1200 AND get your own kids out the door for trick or treating. But I bet everyone appreciates it. Can't wait to see what you post next. Wow, sounds like your house is the place to be for Halloween. Love the milkshakes, how creative! How fun, to have such a motivated street, our is very boring….I love these milkshakes and the topping are fab, have fun creating new treats!! These shakes are perfect. I have never thought of using pumkin to make a shake and now im thinking how i lived all this time without this wonderful idea. Looks gorgeous! Great pictures of your decorated house for Halloween! Those pumpkin smoothies look incredibly tasty! Lovely smoothies and a great fun idea! Wow! These are such a fun idea for halloween!!! Three great ideas…they all look tasty. I think the pumpkin-snap would be my fav. Can't imagine getting so many trick-or-treaters…we get about 5! 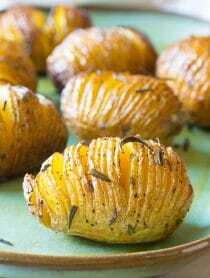 These sound fantastic! I love pumpkin, but would have never thought of making a milkshake with them. Now I'm thinking smoothies, and that coffee one would be perfect for fall mornings. So glad you found me–I've bookmarked your blog, cause everything looks delicious. 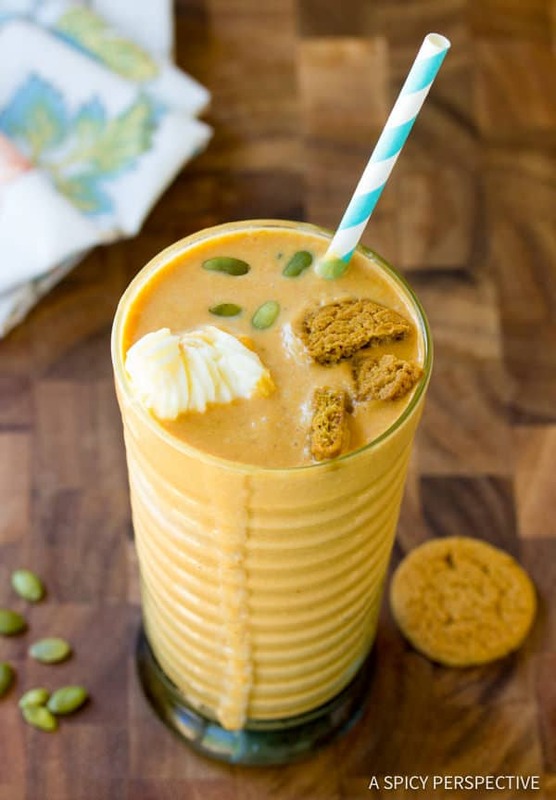 I love all of the three pumpkin milkshakes – so creative! Sommer, I think it's so cool that your neighborhood goes crazy over Halloween. I wish that it was like that where I live. I love Halloween and I think it's great to see the occassional house on the block that goes all out with the scary stuff on the lawn. I would get a kick out of seeing every house on the block decked out. That must be so much fun for your kids! The milkshakes all sound awesome. I really like the way the banana pumpkin one sounds. I wish I was invited to your party! Sommer, I was dreaming about pumpkin milkshakes the night before last. You know, when you're in that state of half asleep/half awake? I started to dream/think about pumpkin milkshakes (smile). Yours sound delicious! I think I love Halloween much more as an adult than as a kid. Don't get me wrong, I loved it as a kid, too. But as an adult I love getting in costume and going to a party with all my "grown up" friends. It's just fun. Our dogs are so obnoxious with trick or treaters, Halloween night is always stressful. My poor husband sits on the couch and holds both of our oh-so-tough, viciously barking, scary Dachshunds while I pass out the candy. It's a real team effort. (I think I should post a blog entry about this now) I can't imagine having to deal with that with 1200 little goblins coming to our door. I think all 4 of us would need anti-anxiety meds! Hi-Nice blog you have! I put your banana pumpkin shake on my recipefood review site and credited you so perhaps you will get some traffic! I cannot pick which one I like best…I know my kids would go for the bana-umpkin shake. It's right up their alley. I think the most kids we have ever had trick or treat is about 350. I just cannot imagine 1200!!! What a fun neighborhood! Your house looks so great :)…as do all of these shakes…YUM! The Halloween decoration is so fun and I almost got the goosepimples just looking at the pictures. 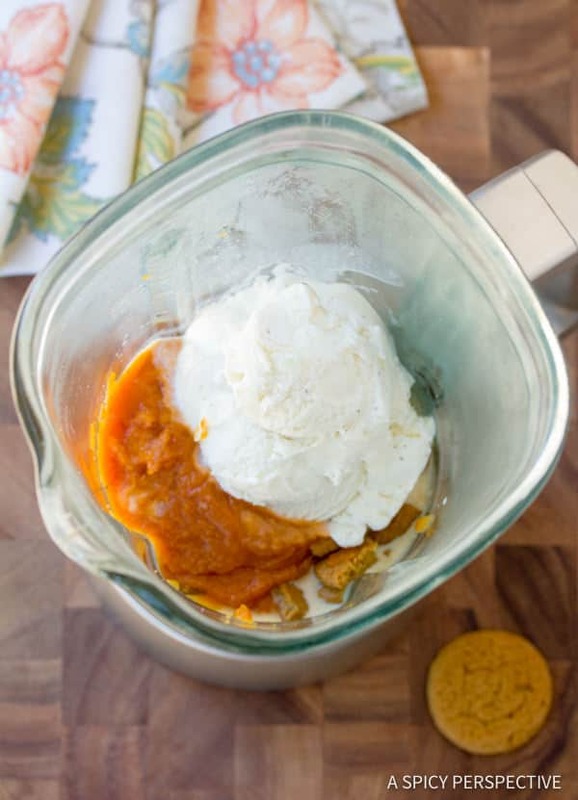 Love the shakes…I have not tried using pumpkin in making shakes as yet. 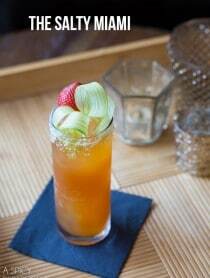 Halloween is not celebrated, neither here in paris nor in BA…We certainly miss the fun! VERY creative milkshakes!! I love the atmosphere! Your milkshakes are perfect for my pumpkin-obsessed cowboy! Thanks a million! Absolutely fantastic pictures and shakes! Those decorations look so wonderfully festive and fun! The kids must love it! Those milkshakes look absolutely delicious! I think I would like the pumpkin snap milkshake for the spicy sweetness. Your shakes sound gorgeous and the spooked up photos are so fitting! You live in the kind of neighborhood I dream about! Halloween is my favorite holiday – my neighborhood is lame. I love all your shakes – especially the pumpkin snap! What an interesting milkshak…can't say I have ever thought of a pumpkin milkshake…may have to try this come Halloween! I love the pictures of the shakes. They are really modern! I can't wait to try out the pumpkin shake. We have a neighborhood like yours that goes all out at Christmas. In fact, it's a requirement to live on that street! I think it's great that you participate. Did you run out of candy your first year? I could use a good party, yours sounds like it would be a blast!!! and I am really diggin' that banana pumpkin shake!! I'd like to try each and every one of those! I love how festive your street gets :) We have a neighborhood like that for Christmas- Juniper Lane..its like they had to do it just because of the name! Halloween is so much more fun though! I've been adding pumpkin to my milkshakes too! It makes such a difference…I feel like I'm sipping on Fall! I loved the different varieties that you created, and I'm eager to make my own pumpkin milkshake a bit more exciting! I love Halloween food! And that banana pumpkin shake looks amazing! Um, if I call it a smoothie can I have it for breakfast even though it has ice cream in it? how fun! those are so cool! i am jealous of your neighborhood- looks like a ball! I love your milk-shakes. My son would love them too. 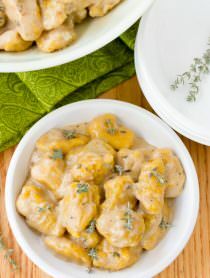 Great recipes! I have to try some of them…I found you through MBC…Thanks for sharing. I love this milkshake:) it sounds really good. I love this post. Thanks for sharing. Gorgeous milkshakes! I particularly like the Java-squash one… I wish our houses in Switzerland would be decorated like that! This is just what I ♥ about October! Fab ideas!! Wow! You really make Halloween a BIG treat. I love these shake ideas. They all sound yummy to me! I think the most we do is carve a few pumpkins and make some tasty festive food. I can't even imagine giving away that many peices of candy,can you ask for tricks instead? How fun to live in a neighborhood like that, I couldn't imagine passing out that much candy…that is insane! I love the decorations, I bet it is such a sight on Halloween night:) All these milkshakes sound yummy, I have to try them all! I love the milkshakes! Yumm! You had me at "pumpkin," but when I saw "java-squash," you sealed the deal. The milkshakes look so good! And the neighborhood really fun!! These shakes are spooky!! Great way to get into the festivities. I LOVE your neighborhood. I wish everyone could grow up in a fun neighborhood like that – where trick or treating hasn't lost its cool.